This hypoallergenic cream with Korean Ginseng is based on 100% natural products. Ginseng cream supports the resilience of the skin. It can be used in irritation. Ginseng cream also protects the skin from aging by sun, sea and wind. When damaged, dry, rough and chapped skin is sensitive use. 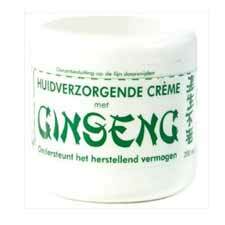 Ginseng creme good Overall a Creme for use anywhere. It is recommended that the cream two times daily to smear.